Cross border transport always poses cooperation difficulties and Singapore and Malaysia provide an interesting set of case studies. Crossing the narrow straits between Singapore and Malaysia one meets some puzzling features. Departing Singapore by rail from the Tanjung Pagar station of Malayan Railways (Keretapi Tanah Melayu or KTM) it is startling to find not a Singapore checkpoint but a counter where Malaysian immigration officials examine passports but stamp none and ignore filled out forms. Heading to Johor Bahru (JB) from Singapore in a shared taxi via the busy causeway that connects the two, your driver might point out the new Malaysian customs and immigration complex that is under construction. It sits to the east of central JB, apparently marooned on a hill, where it was designed to connect to a bridge (maybe a ‘crooked’ one says the driver) that may replace the causeway (or just the Malaysian half of it). Travelling by car from Malaysia into Singapore via the Second Link bridge located at the western end of Singapore you might be impressed by expressways, the checkpoint complexes and the bridge itself, but would also be struck by the lack of traffic (much less than the causeway’s). By the way, you can view realtime online traffic cam images of both the causeway and Second Link. The paper was triggered by curiosity over these puzzling features and uses these cases to examine the role of transport links in cross border processes more generally. It is not primarily a policy paper but transport policy folks might find something of interest in it. 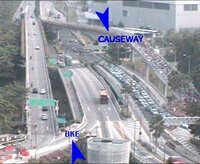 … in 1996 with the Second Link not yet open, [Malaysia's then PM] Dr Mahathir suggested informally that the causeway be replaced by a bridge. Singapore was reluctant but in 1998 suggested inclusion in the package approach … Talks on the bridge continued into 2002 but when the package approach fell through in October the Singapore Government dropped its support. 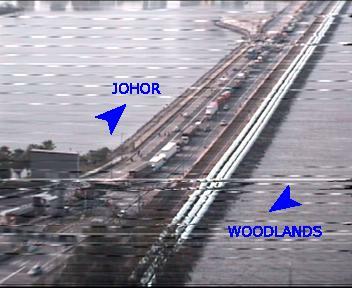 The bridge project was deferred in a 2004 budget trimming exercise but in late January 2006 it burst back onto Malaysia’s official agenda. Malaysian leaders have announced the intention to proceed. If Singapore agrees it will be a full bridge and if they don’t, then it will be a half bridge (now to be called the ‘scenic’, not ‘crooked’, bridge). The proposal can also be seen as consistent with Malaysia’s developmental approach to major projects and, some critics have said, of Dr Mahathir’s fondness for mega-projects (Kim, 2005). Singapore has usually been seen as more cautious in such investments, with cost-benefit analysis as a key tool (albeit rarely made public). However, Singapore’s developmental state has in fact also made ‘strategic’ investments in transport infrastructure in order to enhance national competitiveness and strategic interests even when evaluation has not clearly supported them (Phang, 2003). This developmental interpretation makes more explicable the lack of evidence presented publicly regarding economic evaluation or cost-benefit analysis, including impacts on traffic and capacity. Most proponents tend to imply that it is self evident that the causeway has a capacity problem. Perhaps the benefits are thought to be obvious in light of demographic scenarios that raise the not-too-distant prospect of almost 10 million people in this region? … the half-bridge proposal may be intended to avoid a repeat of the toll-related problems of the Second Link [more on this below]. In contrast with the Second Link, this is a government financed project under the Ministry of Public Works ... Although this financing model does not require tolls, it seems likely that a toll will be levied. There are several reasons for this: the causeway already has a modest toll (Malaysian, and a symmetrical toll by Singapore); the Second Link is still losing money and undercutting it with a new and better bridge would make this worse; and a toll-free bridge (especially a half-bridge built entirely by Malaysia) might be seen as benefiting mainly Singapore users at the expense of Malaysian taxpayers. Singapore’s leaders have expressed concern publicly over possible toll rates. At the signing of the 2001 agreement that included a full bridge, Singapore’s Senior Minister Lee Kuan Yew argued for toll charges to be the same as the Causeway (Pereira and Ng, 2001). Later in an echo of the Second Link problems, Prime Minister Goh argued that symmetrical tolls would have to be applied (Singapore Ministry of Foreign Affairs, 2003). Interestingly, a half-bridge option would make such symmetrical tolls absurd in the eyes of the public. This reveals another benefit for Malaysia of the half bridge idea, in that it undermines Singapore’s position on symmetrical tolls. I should explain that tolls had been a source of conflict when the Second Link opened in early 1998. Singapore authorities insisted that any toll would need to be shared by both sides, or else both sides would need to impose a toll (Straits Times, 25 March 1990). The rationale for this appears to be concern to prevent the other side from ‘creaming’ all the toll revenue that the market would bear at the crossing. However, the Malaysian Minister for Public Works complained at the time that the Malaysian concessionaires had spent much more on the project than Singapore had, including building 1.7 km of the 2.0 km bridge (Straits Times, 24 December 1997). A result of all this is apparently excessive tolls, which seems to be a key factor in the Second Link being a missed opportunity for both sides. Returning to the Crooked Bridge story, we should note that this short border is one of the busiest in the world, with roughly 80 to 90,000 people crossing each way per day (some say more). Trade is huge. Police on each side routinely hand over suspects to the other. Clearly there is a huge amount of pragmatic cooperation going on. Yet, it is particularly striking that efforts to enhance a transport link are here being pursued in such a way as to avoid the need to cooperate, and in ways that actually worsen bilateral relations! A crooked half-bridge would provide a wonderfully ironic symbol of the prickly yet intimate relationship across the straits.